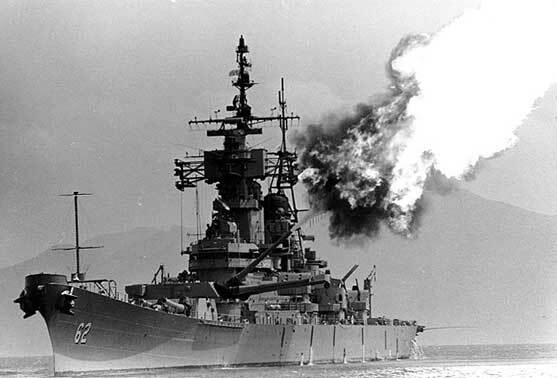 The big new U.S. Navy battleships had the most effective secondary armaments ever deployed, for the decision was made to combine into one system the guns that would fight attacking bombers and closing destroyers.The Royal Navy went the same way but with seriously flawed guns and controls. All of the other navies mounted two separate sets of guns on their ships. For example, the Bismarck mounted 150mm to fight ships and 105mm to combat bombers, the Littorio 152mm and 90mm. Taken separately they were good guns and systems but it meant that when firing at a single target type they had fewer weapons available than the American ships. It could be argued that when under attack by both ships and aircraft the USN concept would prove wanting. On the other hand this would be an unlikely event — a rare example being when the Japanese Centre Force was under simultaneous attack by both the planes and destroyers of "Taffy 3" at the battle off Samar. Just one purpose. 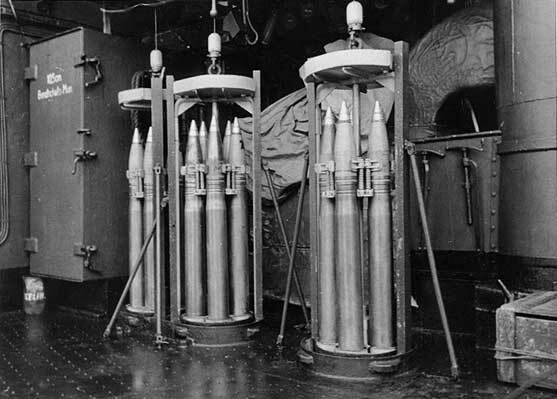 105mm anti-aircraft ammunition aboard the battleship Tirpitz. The key component was the much-vaunted 5-inch 38 calibre gun. What was impressive about this weapon was that it was a compromise, not very good at either task but perfectly competent at both. The difficulty faced by all navies was not in designing a gun that could fire effectively at both high and low elevations, but in ensuring that it could be quickly loaded at both. If a gun like the American 5-inch/51 had a long barrel set so that it could be easily loaded when firing at a destroyer, when cocked up to shoot at a bomber its breech would be touching the deck. Whatever one did this resulted in a clumsy and slow rate of loading. On the other hand a short-barrelled anti-aircraft gun (such as the 5-inch/25) could be loaded at any angle with the greatest of ease, but was totally inadequate as a long range ship-killing gun. What the USN designed was the ultimate compromise, with its breech height set to achieve the maximum rate of fire in both situations. As an example, the New Jersey managed to pump out no less than 394 aimed rounds in less than three minutes at the destroyer Maikaze on February 16th, 1944. In contrast the Royal Navy was very dissatisfied with the 5.25-inch guns mounted in their modern battleships. The much heavier shell (at the upper limit of hand loading) was the primary reason for the distinctly unsatisfactory rate of fire — an insipid eight rounds per minute compared with the almost 20 rounds a good American crew could produce with their 5-inch gun. There was a good British dual-purpose weapon, the 4.5-inch mounted in rebuilt older battleships such as the Valiant and the new armoured aircraft carriers. Depending on crew quality it could match the 5-inch in rate of fire. But it lacked the American secret weapon. This was not the gun, but the best secondary fire control system fitted in any battleship. Indeed it was given the ultimate compliment when used in the new Royal Navy battleship Vanguard after the war. With this size of gun, control systems were far more important than gun or crew. There was a famous example of this early in the war when two crack destroyer flotillas met in the First Battle of Narvik. Their guns (the British 4.7-inch, the German 127-mm) were designed just to shoot at enemy ships, their gun crews were among the very best in their respective navies, yet they managed a derisory hit rate. The problem was that the director systems were just not good enough when faced with fast-moving ships clouded in smoke and making abrupt changes of course. Fascinated as we are with the size and number of guns we often overlook this issue. Take an example using American destroyers and battleships. Two good destroyers (such as the Benson class) mount the same number (ten) of 5-inch guns on the broadside as would the North Carolina or Iowa. However, the effective power of the battleship guns would be at least double, as its elaborate fire control and advanced radar, backed up by multiple spotters working from a much greater elevation, meant that its rate of hits per gun would be far higher. Even the ability of a destroyer to violently change direction could be countered by the much steadier firing platform of the bigger ship. A solid gunnery platform. New Jersey pounds the Viet Cong, 1969. Strangely, this very rate of fire proved something of a handicap when both the 16-inch and 5-inch were firing at the same target. In the same engagement as mentioned above the Iowa was firing at the light cruiser Katori at a range of about 14,500 yards, suitable for both main and secondary guns. She shot 46 heavy rounds but her spotters had no idea if she was hitting the target. The problem was the very confusing shell splash pattern, caused by the smaller guns firing ten times between each main salvo. On the topic of big guns, the Iowa was using the new 16-inch 50 calibre guns, designed to compensate for the lack of range and attenuated flight time mentioned in my last Daily Content. In theory these were immaculately impressive weapons, but there were some troubling features that persisted for several years. This cannot have been a total surprise, as a comparable move by the Royal Navy before World War One had created difficulties. In that case the move from the 12-inch/45 to a 50 calibre version shortened barrel life and reduced accuracy at long range. Tactically, the trouble was most acute during the initial, critical salvos and was the result of several factors. One was that they used light weight barrels and therefore subject to the "cold gun" condition. For example, two of the class were engaged in long-range fire (about 35,000 yards) against the destroyer Nowaki, Iowa just after all of its guns had been deluging Katori. Although neither ship obtained consecutive straddles Iowa did much better than New Jersey. It was deduced that this was partly because her guns were already warm. Also she was firing full nine-gun broadsides. Although the interval between shots was greater this meant that her spotters, both human and radar, had a much better chance of knowing if a straddle had been obtained. There was another, rather strange, phenomena: The guns overshot their calculated target spot by as much as 1,000 yards when firing at long range. There seem to have been several causes, the most surprising being that the barrels were not wearing out as quickly as predicted! The new, longer guns did have, as could be expected, a slightly poorer dispersal factor than the 45 calibre weapons. In this case an unexpected problem was that their propellant was less consistent in quality, one not corrected until the 1980s when the navy started to use propellant from the 45 calibre weapons. It is astonishing that it was still around, thirty years after the guns that could use it had gone! Despite all these weaknesses, it must be emphasised that these were formidable and deadly guns, but not quite as superior to all others as is often assumed. In the final part of this series I will cover the protection of these great ships and suggesting some alternative values for their beautiful counters. Most of the “new” information found here comes from the very informative and interesting magazine Warship International. Subscriptions and back copies can be obtained at www.warship.org. 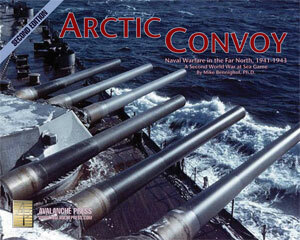 Put the "destroyer killers" to sea in Second World War at Sea: Arctic Convoy!